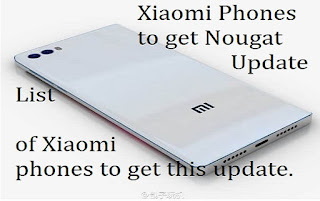 The popular leading mobile manufacturing company has a good news for their users who are using various models of Xiaomi phones,they are going to release a update of Android latest OS(Nougat Features) i.e Android Nougat if you observe there is mobile from Xiaomi which already got this Android Nougat OS 7.0 for the mobile Mi Max along with the MiUI. So along with this Mi Max mobile there are few mobiles which are going to get this Android Nougat,around 14 mobile devices are going to get this OS update,but unfortunately there is no update yet for the Xiaomi Redmi 4 isnt receiving any update of Android Nougat yet. when would be redmi not 4 is getting nougat update?